"The young lions do lack, and suffer hunger: but they that seek the LORD shall not want any good thing." - Psalm 34:10. This is really one of the most promising scriptures. Just by reading what it says it should give us believers yet another confirmation that God, is there and that God, does care. Let's look at the facts there are millions upon millions of starving people and at times us believers don't always do financially good. We struggle at times, but we always have what we need. We have a home, food, clothes, etc. We are not just another number of starving people, we are not living in want. If you know a believer that isn't getting what they need to survive then perhaps their faith isn't great enough. Maybe they aren't trusting God, as they should. The fact that so many are poor and living on the streets and that we believers some how always make it through and have food, clothes and etc is not coincidence, but it's a miracle of God. Count your blessings and know where each and everyone of them come from. 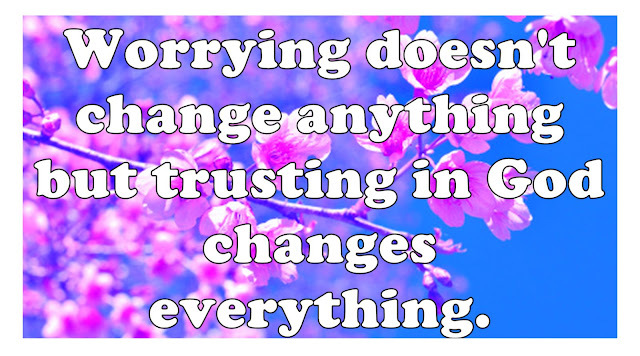 God, loves you and tells us not to worry because He will provide for us! God, even made sure the grass of the field is clothed, imagine how much more He will make sure you are taken care of! We're talking about a God, who created and loves all creation and put us on the top of that list of creation. He made us the most important creation ever created! We're even more important than the entire Earth because it won't remain and we will! He made us higher than the angels! A lot of you are in worry and you never do learn. Each time trouble arises you worry and then God, pulls you through every time and then another problem arises and you forget how you got out of the last problem. The problems are only a problem if you think of them as a problem and not just something that God, will take care of! The Lord, got you this far and He'll get you through. So what you're broke and haven't got money to get by the rest of the month. God, created Heaven and Earth, do you not believe that He is also able to give you a few bucks to survive the rest of the month? That's a part of the problem too is that I can hear people say, "Well, God, doesn't give people money. God, doesn't even have money." God, is in control of everything. The people who are rich are rich because God, granted it. So when you're in need and you receive stuff: Money, cars or whatever you might as well just take it as something that God, owned and wanted to give to you. He has everything in His hands. There is nothing that He doesn't have. Whatever it is that you need: Healing, joy, money or whatever then God, is able to give it to you! All you believers are getting by just fine, but some of you worry too much. Stop worrying! I come before you today to pour out my worries, anxieties and fears at Your feet. Lord, please remove everything that is causing worry, stress, grief, and sorrow in our lives and bring a peace into my soul that passes all worldly understanding. Please help us to put our faith and confidence in you. Thank you for hearing and answering my prayer. Gratefully, In Jesus Loving Name I Pray, Amen."